Often referred to as a Flick Shake, a weighted jig head paired with a wacky rigged stick bait catches bass all over the country, almost all of the time. If you’ve fished a weightless wacky rig, or you’re looking for a new finesse technique, this one’s for you. A weighted jig head or ‘Flick Shake’ is essentially a weighted jig head sitting on top of a wide gap finesse hook. Think of it as a wacky hook with a weight. It’s designed to be paired with your favorite plastic stick bait, and rigged wacky style. Pairing a flick shake with a Senko or Trick Worm style bait will provide an irresistible shimmy action as the bait falls. 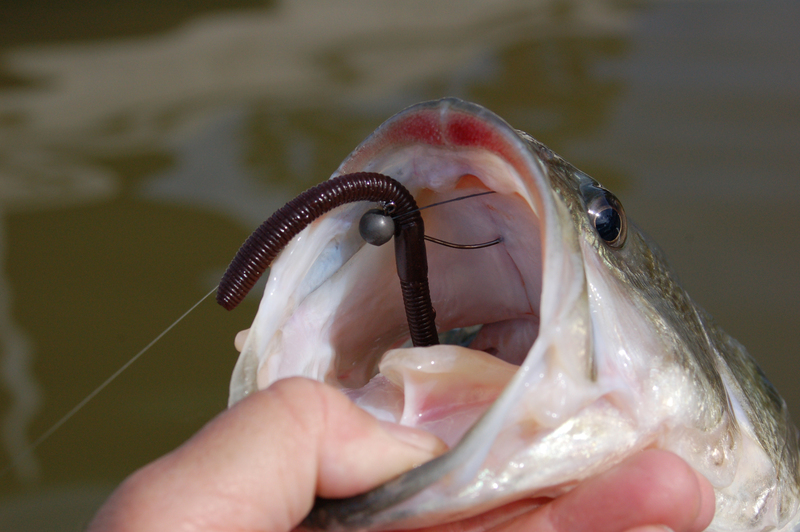 As the jig head pulls the bait down, you’ll see your worm dance all the way to the bottom. Usually, a natural presentation will be the best choice, so choose the lightest weight you can get away with. I like to use anything from 1/16 oz to ⅛ oz, but I’ll use a heavier weight in deeper water or current. Spinning equipment works best for this finesse presentation. Use a 6’9’’- 7’0’’ spinning rod with a fast tip, paired with a 2500 size spinning reel. For line, go with fluorocarbon or light braid to a fluorocarbon leader. Using 6-12lb test will be just fine. One advantage of weighted jig heads, compared to a weightless option, is speed. The added weight to the wacky jig head helps you cover water much faster, while still presenting a finesse presentation. Another bonus is that the added weight and increased fall rate also helps you apply the technique in deeper water, or while fishing in current. Rig up your weighted jig head when fishing shallow cover like docks, brush, laydowns, or stumps. Try it when you move out deeper and focus on weedlines, rock bars, points, and other offshore hangouts. Cast out and let your bait fall to the bottom on a slackline. Once it hits bottom, give it a few hearty pops, and let it fall back to bottom. Continue this approach all the way back while changing the lifts, pops and pauses. Popping and lifting will help show off the baits shimmy action, while driving bass wild. Keep a close eye on your line while the bait descends back to bottom, I get most of my baits on the fall. Bank fisherman should keep a wacky jig head in their arsenal at all times, it’s a technique that works almost everywhere, and it’s easy to fish from the bank. It’s subtle action and slow fall is perfect for fishing ponds, lakes, or creeks. The beauty of the bait is the versatility and natural presentation. When fishing from the bank try casting it parallel to the shore, working it slowly back to you with intermittent hops and pauses along the way. When you get a bite it’s important to remember what you were doing, and at roughly what depth you were fishing. Doing this will help you develop a pattern on where the fish are at, and what they’re wanting on that particular day.